Turkish President Recep Erdogan calls recognition of Jerusalem as Israel's capital a 'red line', threatens to break off ties with Israel. Turkey’s president warned the United States not to recognize Jerusalem as Israel’s capital, or to move the US embassy in Israel to Jerusalem, saying that any change to the status quo vis-à-vis Jerusalem would constitute a “red line” for Muslims. President Recep Tayyip Erdogan, Turkey’s hardline head of state, demanded President Trump neither move the US embassy to Jerusalem, nor even issue formal statements recognizing the city as Israel’s capital. “Mr. Trump! 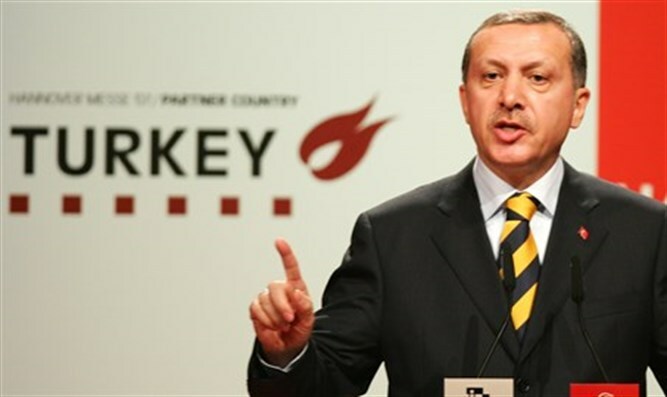 Jerusalem is a red line for Muslims,” Erdogan said in a televised statement Tuesday. Erdogan added that if the Trump administration made good on Trump’s 2016 campaign promise to relocate the embassy, or made any other steps to recognize the city as Israel’s capital, Turkey could “go as far as to” sever all ties to the Jewish state. Israel and Turkey signed on a comprehensive reconciliation deal last year, ending a six-year diplomatic standoff following a violent encounter between Israeli soldiers and Islamic radicals on a ship attempting to break through the security blockade on Gaza. On Monday, Turkey’s Deputy Prime Minister, Bekir Bozdag, warned of a “major catastrophe” if President Trump recognized Jerusalem as Israel’s capital. "It would completely destroy the fragile peace process in the region, and lead to new conflicts, new disputes and new unrest." On Monday night, the Trump administration allowed a security waiver, which enabled the US embassy to remain in Tel Aviv, to lapse, marking the end of the latest six-month suspension of the 1995 Jerusalem Embassy Act. The act, which was passed by a veto-proof bipartisan majority, required the relocation of the US embassy to Jerusalem by 1999. Every president since Bill Clinton, however, has issued six-month waivers citing “national security interests” to suspend the requirement.